Vectir is an application to control a computer remotely using a smartphone. This application can also work like a keyboard and mouse to open, close, and run applications contained in computer. Vectir can work on a touch screen or keypad smartphone. Condition, this smartphone should support Java. Meanwhile support for connections include Wi-Fi, Bluetooth, and infrared. To activate it, you must install this application into destination computer and also to smartphone which want to be used as remote control. For example, if you Android users, first install Vectir application available on Google Play Store. Installation on a computer made easier with inclusion of the guidelines until final stage. 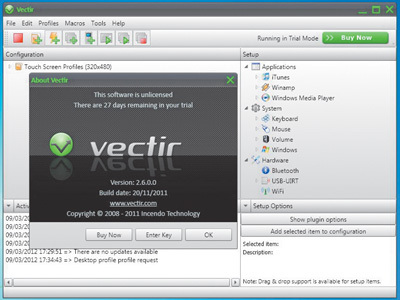 By default, Vectir allows access to five major functions on computer, that is Desktop Profile, System, Winamp, iTunes, and Windows Media Player. But you can still add other functions, such as running office applications and more. There is also a function to restart, log off, until shut down can be done from smartphone. On Desktop Profile option, you can view the desktop on a PC through smartphone screen in real-time, even when your computer running a video or other applications. System functions allow to browse the entire contents on a computer. Vectir will display all the existing drive on your computer and get full access to run it from smartphone. Applications on Android can be downloaded and used free of charge, whereas computer version is a paid application. However, you can use trial version for 30 days without any feature restriction. With Vectir application, you can controlling computer remotely utilizing wireless connections from smartphone. Access options can be set by users to make Vectir flexible used for all kinds of purposes, such as monitoring, accessing, and running a multimedia files. This application is suitable for controlling a HTPC (Home-Theatre PC). Plus: Supports three types of wireless connections; real-time display, supports video content; access options can be customized.